Do you have a celebration coming up? Hen party, Birthday, Girly get together? Or do want to work better as a team? Then come party at Flight Fitness! Our Hen Parties last for 2 hours and you have the run of the whole studio, so you can design your big day to be just the way you want it! 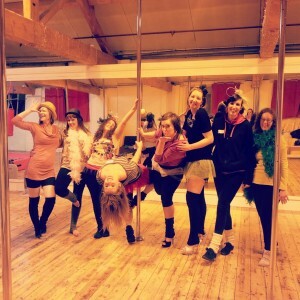 It can include a pole dance class, a burlesque class, a hula hoop class, a chair dancing class, an aerial hoop class or a mix. Learn some of the sexiest moves and have a giggle, bring your camera to capture everything (including blackmail photos!) - a sense of humour is a must. We can also play games and we can provide the prizes. Heels are optional but encouraged, so release your inner diva for the day! Bring 10 people and the hen goes free! Get in touch for a quote today! The studio is available from 10am – 10pm. Please contact us to book your perfect Hen Party. Want to celebrate in style and do something different? Then book a Birthday Party in Leicester with us and choose what you want to do. Pole Dancing, Aerial Hoop, Chair Dancing, Circus Skills, Burlesque, Hula Hoop or even learn to dance like Rhianna, Beyonce or Lady Gaga! Would you like to work as a team more efficiently? Try our Circus Skills classes as an engaging way to develop communication, planning and teamwork skills vital for success. In a 2 hour exercise we can provide each guest with their own poi, contact staff, spinning staff or hula hoop. First we can work on the basic skills before choreographing a group piece to bring all your skills together in a Grand Finale! And blow out those office cobwebs with a fire show by the instructor at the end! However big or small your budget we have something to suit you – so please get in touch now.